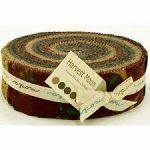 Moda - Kansas Troubles Quilters Harvest Moon Jelly Roll. In Stock! Shipping now! Moda - Kansas Troubles Quilters - 32 fat quarter bundle. In Stock! Shipping now! Moda - Kansas Troubles Quilters Holiday Medley Jelly Roll. In Stock! Shipping now!